Featuring bride & groom’s names on the front and thank you words in elegant script lettering on the back, this burlap and lace textured gift tags will make every gift special. Here are the fonts that have been used in the gift tag above. Like this wedding favor? You can personalize it with your own wording and details at elli. Designed by American designer Laura Worthington, Alana is a hand lettering based script typeface with a slight rough look. It is a versatile typeface with 341 alternates which include two additional uppercase letter sets and hundreds of alternate lowercase letters. In addition, the font family comes in 62 whimsical ornaments which can be used along with the main fonts. 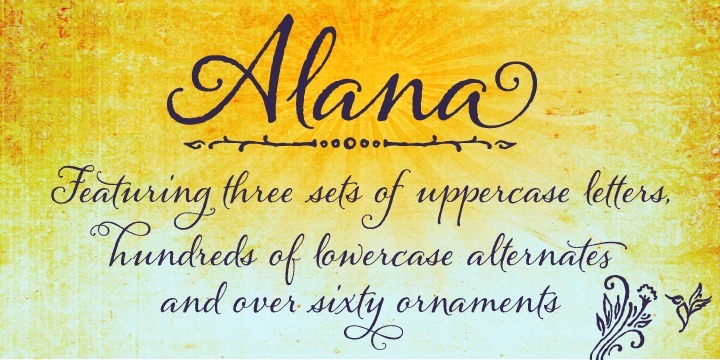 You can buy and download Alana at Myfonts.